Anyone that knows me will be aware that I am a huge coffee addict. I love going to cafes and taking the time to meet a friend or spend an hour by myself enjoying a coffee and slowing down. Having a coffee feels indulgent but not excessive, it adds structure to an empty day or reflection in a busy one, it picks you up, it calms you down, it’s a chance to be social or to get lost in your own thoughts and wherever you are in the world, no matter how different the place is, a coffee shop is a coffee shop and that’s a comforting thought. 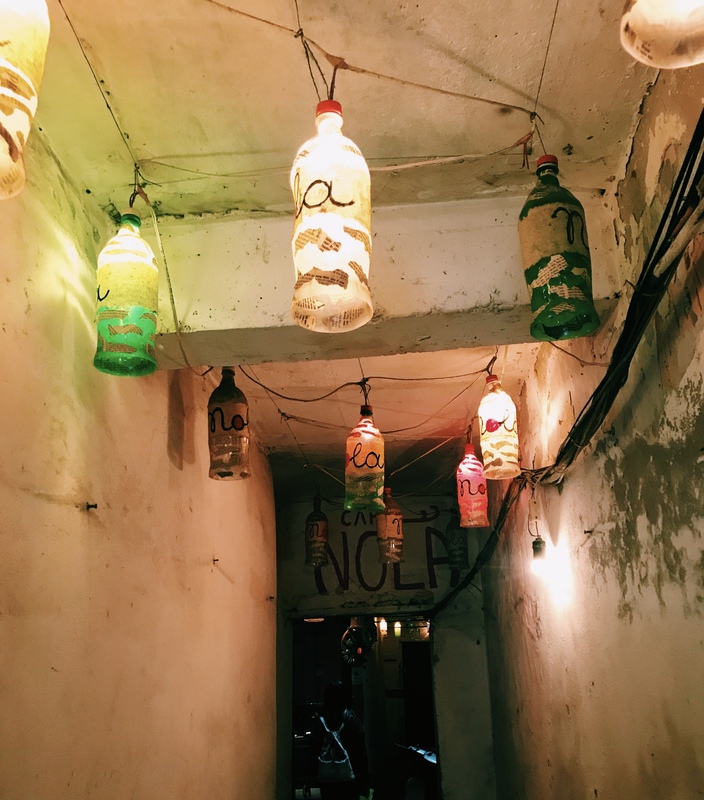 I’m writing up a list of reviews on my favourite coffee shops that I’ve been to around the world for a new section on my blog so here’s the first one: a review of quirky Vietnamese Nola Cafe in Hanoi. Hope you guys enjoy reading about these cafes as much as I did visiting them. I didn’t realise how big of a thing coffee was in Vietnam before I went but this South East Asian country is the ultimate destination for coffee lovers with no end of intriguing and alternative coffees and an endless choice of quirky cafes to drink them in. In a city as wonderfully chaotic as Hanoi, coffee shops are the one place you can go to escape from the madness and I don’t think I found another place on my trip that was as serene and tranquil as Cafe Nola. Hiding in plain sight with an entrance through a narrow alleyway in the heart of Hanoi’s Old Quarter, I would have easily missed Cafe Nola if I hadn’t been looking for it. Nola Cafe is located at 89 Pho Ma May, Hang Buom near the Hoan Kiem lake. It’s probably best to plug the address in Google Maps as it’s tricky to find. I’d read about this cafe in my Lonely Planet guidebook that I’d been religiously carting round the country with me so I assumed that the cafe would be full of guidebook loving travellers but I was the only person there. If like me, you’re partial to posting a few Instagram’s then the arty decor of this cafe will win you over. Undoubtedly, getting up to the actual seating area of the cafe was a bit of a workout as I had to climb a steep, narrow flight of stairs to get there but once I did it opened up into a beautiful, wild overgrown garden and outdoor seating area covered with multi coloured patterned umbrellas, little lanterns and dotted with mismatched furniture. Despite it’s location in the centre of the city, all of the noises integral to the city like beeping motorbike horns were silenced and all I could hear were the sounds of birds chirping. As someone on their first solo backpacking trip, this little sanctuary was just the mental escape that I needed for an hour or two from the fast paced city. Cafe Nola offers food as well as drinks on its menu however it caters for tourists and food prices are higher than you’d pay in most restaurants and the food is less authentic so I’d recommend coming here just for coffee. Its drink selection is very westernised serving all the usual coffees that I’d have at home like a Flat White, Long black and cappuccino’s as well as smoothies and cocktails. I went for a black coffee and an iced sweet jasmine tea. Prices are high by Vietnamese standards but low in comparison to the UK with coffees averaging £2 and food around £3-£4 a dish.